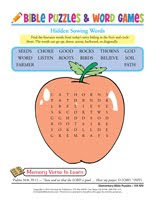 Let your students do a couple of fun Parable of the Sower Pencil Puzzles for your Sunday school or Bible club program. Give each child a pencil and a copy of each puzzle. These two puzzles come as one download you can purchase for just $1.99 for the set of two. Choose either the KJV or the NIV version. Then print as many puzzles as you need. The first puzzle is a simple word search (pictured). 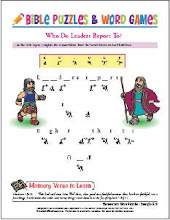 The second puzzle is a picture puzzle to help your students review the Bible story. Answers are included in the download. As the children work the puzzles, talk about ways they can tell others about Jesus this week, sowing the seed of God's Word. Make sure names are on the puzzles after they are completed. Have a child read the memory verses (Psalms 34:8 and 39:12) aloud. Say them together a few times. Then let each child have a chance to say the verses individually. Click on the image above to download the Parable of the Sower Puzzles. KJV is on the left and NIV is on the right.